From the cover of the Alberta Government’s new proposed guidelines on gender identity for schools. EDMONTON – The Government of Alberta recently released proposed guidelines on sexual orientation that are to be adopted by all school districts in the province. Alberta-British Columbia District President Glenn Schaeffer has responded to the guidelines, encouraging ABC District members in Alberta to make their concerns known to elected officials, as well as to keep the situation in prayer. 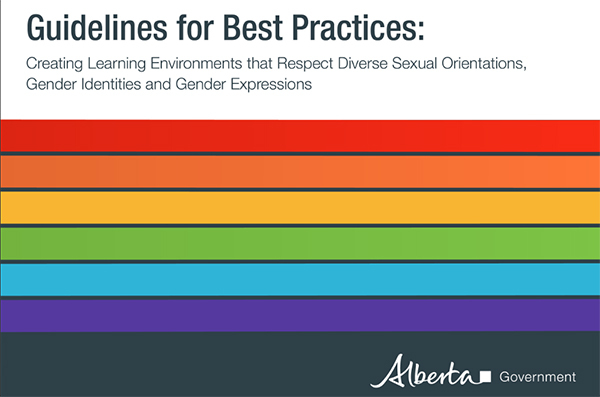 The Alberta NDP government is insisting that all school districts adopt proposed guidelines that “create learning environments that respect diverse sexual orientations, gender identities and gender expressions.” Schools should provide a welcoming, caring, respectful and safe learning environment for all students regardless of the challenges they experience. But, in the name of fostering diversity and inclusion, the NDP government is imposing an extreme form of gender identity that is contrary to the expressed will of our Creator who created “man in his own image, in the image of God, he created him; male and female he created them” (Genesis 1:27). The government’s proposed policies also fail to respect the privacy and rights of other students and their parents who think expressions of the LGBTQ lifestyle are immoral and who are uncomfortable having transgender students in their change rooms and bathrooms. The Edmonton Metro (January 29-31, 2016) observed that a “loophole in Alberta’s School Acts means private schools may not be bound by laws requiring schools to create new policies for LGBTQ students” but the same article quotes Jeremy Nolais, Minister Eggen’s press secretary as saying, “Private schools still need to be providing safe and caring settings that recognize the requirements and grounds for discrimination in the Alberta Humans Rights Act and other applicable legislation, like the Canadian Charter of Rights and Freedoms.” Private schools, like St. Matthew’s Lutheran Academy School in Stony Plain, are safe and caring settings for children and yet, these guidelines may have a significant impact on their future sustainability, especially if the government ties funding to these policies. How might you respond to this government initiative? 1. You are encouraged to take a moment to read the proposed government’s “Best Practices” guidelines. 2. Pray for school board trustees, educators, and government leaders who are responsible for the development of policies related to this issue. 3. If you are inclined, please take a moment to sign a petition at Life Petitions that expresses your concern over the implementation of the proposed guidelines. 4. Send an email, write, or call your MLA and voice your opinion on the matter and copy the Premier and Minister of Education as well. Rev. Dr. Glenn E. Schaeffer is President of the Alberta-British Columbia District of Lutheran Church–Canada. Perhaps “President” Schaeffer could expend rather a bit more effort focussing on the gospel proclamation of our church rather than the usual “Missionalism, Moralism, Money” focus of the District. Yes, maybe the “President” should get focused on the lives of people in Alberta and British Columbia that have been decimated by having their life savings, and their identity as Lutherans, taken away by LCC and ABC district. Since private schools are not funded by the government and parents choose to have their children go to these schools, if the parents of these so-called special children don’t like the rules don’t go there, go to the public, government funded schools.